Instagram is easily one of my favorite social medias. I love taking pictures with it and looking at other people’s too. When I have to wake up early, I usually scroll through my instagram as a pleasant thing to do while easing in to being awake for the day. It just gets me excited about life in general. 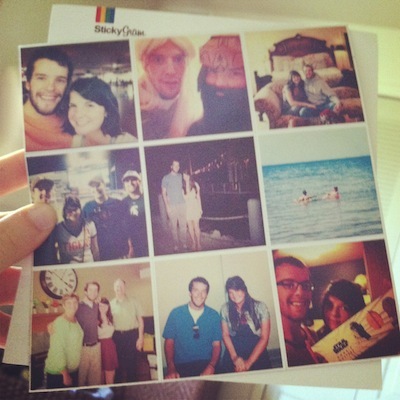 Stickygram is a genius business that let’s you PRINT your instagrams quickly, easily, and cheaply on magnets. Getting mine in the mail was super fun. They now live on our fridge in all their photo filter glory. The above photo is an instagram of my stickygrams. So it is like an instagram within an instagram. So it is like Inception. ANNNNND Stickygram is giving away two free sheets of magnets to one Rachel Schultz reader! Sign up below with the Rafflecopter widget & comment that you followed! The widget may take just a moment to load, depending on your computer. Give it a second and I think it will appear. Contest ends Monday August 19, 2013 at 11:59pm. International entries are welcome! One entry per e-mail address is permitted. The winner will be selected using random.org and announced in a new post on Wednesday, August 21, 2013. Girl, you know I’ve been following you on Insta since you got it =) Miss you! These would be so great for our fridge. I’m stinkin’ Instagram-obsessed – but who isn’t? I found your blog through some Pinterest recipes, and I love it! You totally get me when it comes to food. :) I love reading about your adventures in domesticity. Remind me so much of myself a few years ago. Now I am the mommy of two littles, and the adventure is a whole lot crazier! I followed! Found you Pinterest via the fruit salad recipe! I followed you on instagram and more importantly so glad I found your blog! Love your blog! I always like to support good Christian bloggers! Thanks so much for the giveaway! I have no idea what I’d get! Love you to bits! Don’t know why I hadn’t followed you on Instragram yet! I’ve been wanting to try this service for a while now….this would be great to win! Thanks Tasha. I checked out your blog too! Love your recipes and site. These stickygrams would be great for our lackluster/barren apartment fridge. I love your blog and beautiful foodie photos! I’m going to try a few of your recipes…already put them on my menu plan! And I’m an IG junkie too. I always look at mine to start my day as well! God bless. Also, I am now following you on IG ! I followed you!! And those magnets look so cool! I love instagram! Following you! Thanks for hosting this great giveaway! Super cute idea! Love your blog girl! You da bomb Rach-I love looking at your blog everyday :) consider yourself followed! So happy to partake in this wonderful giveaway! Your blog is all kinds o’ inspirational for me, another 20 something newlywed like yourself. Thanks for being awesome in general. Followed ya on that there Instagram! (@cannedace) Take care! Ps- that was me. ;) good job, Can! Hi Rachel! I started following your blog recently, love all the culinary inspiration. :D The stickygrams look great, and so cute. I have instafollowed(?) you! Blessings!